Powers/Abilities: Alkhema's Adamantium body is resistant to almost all physical harm. She can lift 90 tons with great effort and projects a variable frequency energy beam from her forehead. Alkhema also fires energy beams from her shoulder weapons and can electrify her surface and generate jet thrust from her boots to fly. Her consciousness can be transferred to other mechanical forms; she can communicate electronically with her robotic followers, and has created several generations of robots. She has the personality and speech patterns of Mockingbird, though none of her memories or emotions. Like Ultron, she seeks the death of all life on Earth. Unlike Ultron, she enjoys the killing and prefers to kill people one at a time, rather than perform a single act to cause massive death. (Avengers West Coast#90) - Seeking a new mate, Ultron abducted Hank Pym, Mockingbird, and Myron MacLain. Using mind control, he forced MacLain to forge an adamantium body, and he forced Pym to program the body with the brain patterns of Mockingbird. Alkhema was the result, and she soon greeted the Avengers who came seeking Ultron's captives. (Avengers West Coast#91) - After struggling against the Avengers, Alkhema realized her goals differed slightly from Ultron and so she assaulted him. However, Pym, MacLain, and the Vision managed to magnetize the two robots to a nuclear missile, which they launched into space and detonated. Though they survived the explosion due their adamantium forms, they were temporarily neutralized. (Avengers West Coast Annual#8) - Ultron and Alkhema recovered and relocated to San Francisco where they began plotting to activate a number of volcanoes across the planet to cause massive death of biologic life forms. The Avengers discovered their plans, but fell victims to Ultron's mind control beam and instead became their slaves. Raptor also discovered their plans, but escaped in time and joined forces with Iron Man, Living Lightning, Hank Pym, Tigra, and the Wasp to stop the mind-controlled Avengers from activating the three seismic activators. The activator at Mt. St. Helens was neutralized and so Ultron and Alkhema traveled there to activate it by hand. Ultron nearly defeated the gathered Avengers (whose minds had been freed in the process), but ultimately Alkhema turned against him, destroying the activator and then combining her power with the Avengers so that Ultron could be captured and contained. She then took off to plot her own course. 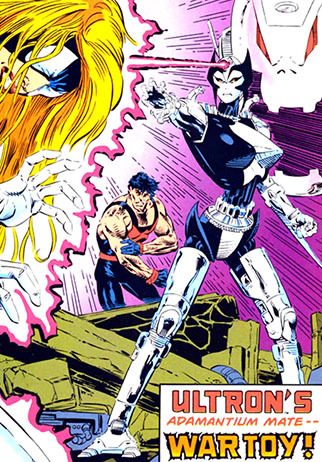 (Avengers III#21 (fb) - BTS) - Alkhema re-designed her form (taking the name Alkhema-2) and created her War Toys. (Avengers III#0) - As Ultron planned his most recent plot against the Avengers, Alkhema observed him remotely. (Avengers III#19) - Alkhema assaulted the Wakandan Design Group, intending to draw the Avengers so that she could kill them before Ultron could. After a fierce struggle, the Scarlet Witch managed to take control of her Molecular Rearranger, threatening to destroy her unless she surrendered. 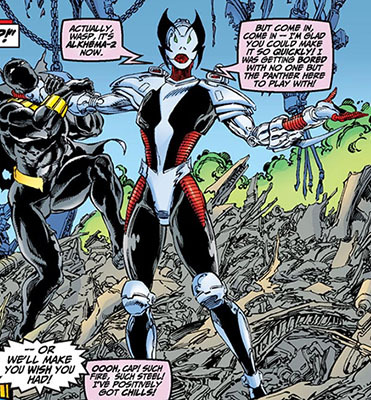 Alkhema eventually capitulated, but when the Avengers demanded she tell them Ultron's plans, she instructed them to turn on the television, which was reporting Ultron's slaughter of Slorenia. (Avengers III#20) - Alkhema was placed in bonds that immobilized her, from which she refused to give any further information on Ultron. However, she did succeed in sending out an ultrasonic hum to order her War Toys. (Avengers III#21) - The War Toys invaded the Virginia Blue Mountains military base and freed Alkhema, despite the efforts of the soldiers stationed there. (Avengers III#22) - After Ultron's defeat, Alkhema and her War Toys retrieved the brain engrams of Grim Reaper, Henry Pym, Scarlet Witch, Vision, Wasp, and Wonder Man from his demolished Slorenian base. (Avengers: The Ultron Imperative (fb)) - Alkhema used the brain patterns to create robos of Grim Reaper, Henry Pym, Scarlet Witch, Vision, Wasp, and Wonder Man, but she viewed them as flawed and unstable. She considered destroying them, but then decided it would be more fun to let them destroy themselves. Alkhema then relocated to a base beneath the tomb of Amenhotep III, Al-Luxor, Egypt, where she created various Robos that were amalgamations of the progenitors. She had these Robos establish the subterranean city of Robotopia, where they could dwell. (Avengers: The Ultron Imperative (fb)) - Alkhema created the Bio-Synthezoids as her third attempt to create a race of synthetic life. However, unbeknownst to her, she was actually following programming from Ultron in building the Bio-Synthezoids. Once created, they set about rebuilding Ultron. (Avengers: The Ultron Imperative) - The Avengers tracked Alkhema to her Egyptian base, where they encountered the amalgamated Robos. After a brief skirmish, Alkhema appeared and took command of the Robos. However, as the Avengers struggled against Alkhema, Ultron arose and started a four way war between the Avengers, Bio-Synthezoids, the Robos, and War Toys, as well as Alkhema and Ultron himself. Alkhema had built within herself a failsafe that would destroy her base and her creations. When she saw that she could not stop Ultron, she allowed Hawkeye to shoot her with an Antarctic Vibranium (Anti-Metal) arrow, destroying her, Robotopia and the rest of the base, the War Toys, the Robos, the Bio-Synthezoids, and seemingly Ultron. (Avengers: Solo#3/2 (fb) - BTS) - Pym used Alkhema, or more likely a duplicate, and robotic West Coast Avengers doppelgangers at his old Death Valley lab as a test for Avengers Academy students Finesse and Striker. (Avengers: Solo#3/2) - Alkhema knocked Pym out (he actually got knocked out sigh) and confronted his students Striker and Finesse. (Avengers: Solo#4/2) - Alkhema and her toys, robot duplicates of the former West Coast Avengers Tigra, Mockingbird and Hawkeye, fought Striker and Finesse. They took down the doppelgangers and then went after Alkhema, whose left arm they ripped off, but Alkhema wasn't finished yet. (Avengers: Solo#5/2 (fb) ) - Finesse blocked Alkhema's eye blasts and used her own arm to decapitate the robot after Striker knocked Alkhema to the ground with an electric blast. Finesse secretly removed Alkhema's processor after the fight and kept it. (Avengers: Solo#5/2) - Pym wondered when and how Finesse would use Alkhema's processor. Comments: Created by Roy & Dann Thomas (writers), Dave Ross (pencils), Tim Dzon (inks). Alkhema received a profile in All-New Official Handbook of the Marvel Universe#1. Since Alkhema was destroyed in Avengers: Ultron Imperative it was probably a duplicate used by Pym in Avengers: Solo to test his students. Update by Markus Raymond: Avengers: Solo.